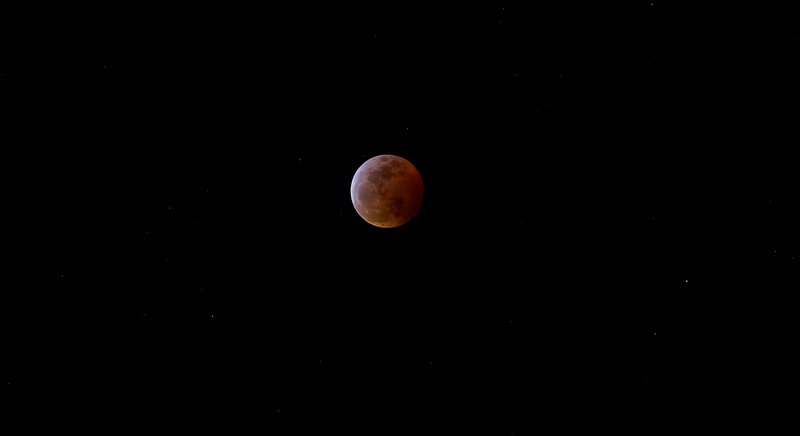 After waiting for months to watch the total lunar eclipse I almost missed. 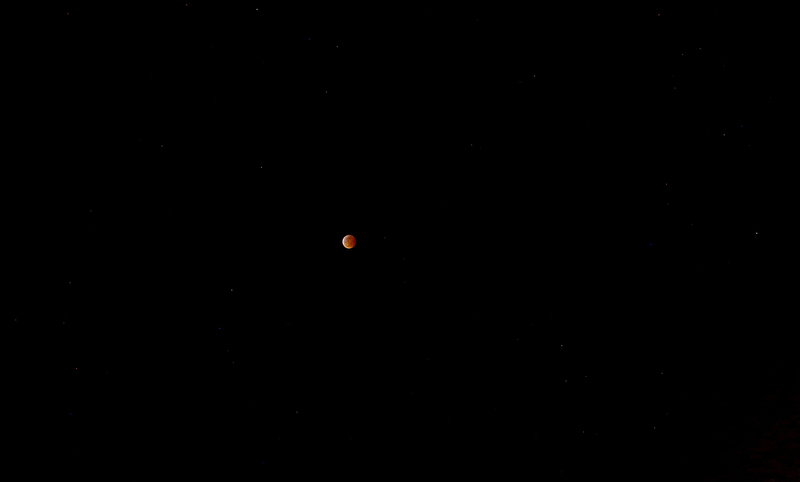 Hard to believe it took a bag of trash to save the day and capture the Super Blood Wolf Moon. 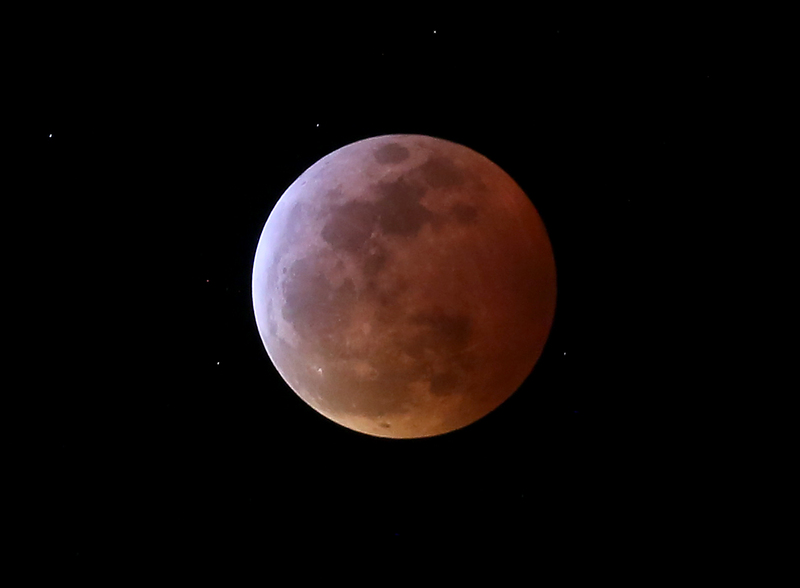 The only lunar eclipse of 2019 almost got away. I had watched the reports of the approaching celestial show and the countdown was on. The full moon on January 20 was touted as a “super blood wolf moon.” The full moon occurring at its closest proximity to Earth in its orbit, called perigee, for the month is called a supermoon; the full moon In January is dubbed a wolf moon for the wolves that would howl outside Native American villages in the midwinter months and the blood moon is the hue the moon is cast in as it passes through the Earth’s shadow for a lunar eclipse. My chances seemed bleak to see the eclipse as a clouds rolled overhead obscuring the stars in the night sky. At 7:30 p.m. when the moon’s umbra would begin to slip across the moon I went outside to assess the situation only to see a faint glow through the clouds as the full moon shone above. I cast any thoughts of shooting the eclipse aside and went about my night. While taking a bag of trash to the garbage bin shortly after 9 p.m. when I stepped out the door I saw stars directly ahead. 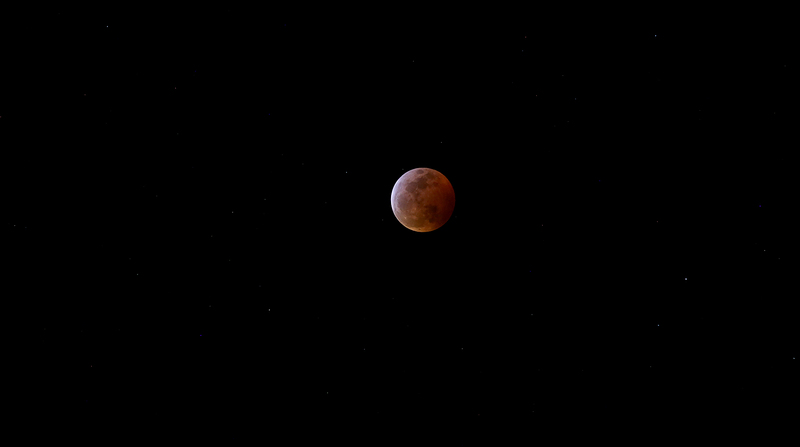 Glancing up to the moon’s location I saw the lunar eclipse had entered totality with red cast across the lunar surface. Sunlight refracting through the atmosphere along with dust and other particles give the path of the shadow the red color. I frantically gathered camera gear together, a Canon 5D MK III with a 300mm lens, tripod and electronic cable release. and set up in my driveway. I put the camera in live view and used the electronic release to keep as much camera shake down as possible. Gusting winds rocked the tripod as panned to find the red orb hanging in the sky. A couple of quick test exposures to get the ISO sensitivity right for the best balance between shutter speed and f stop and I was ready to blaze away at the moon. I managed to get 31 frames taken before I switched to 24-70mm zoom lens to get a wide view of the moon in the sky. I grabbed another five frames and then more clouds crossed the sky and rain began to fall calling for an end to my lunar eclipse viewing. Of the 41 total frames I took I liked about six images. I still feel lucky even being able to see the lunar eclipse. 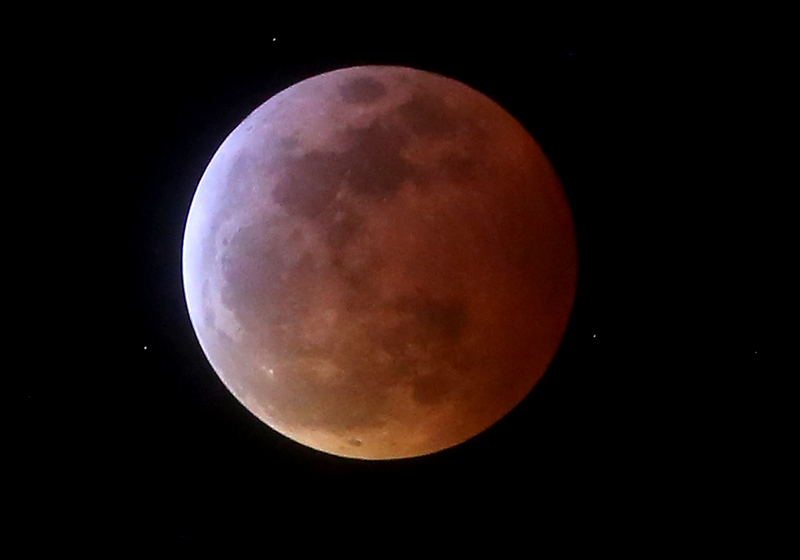 The next total lunar eclipse won’t cross my skies until the early morning hours of May 26, 2021. It just goes to show a little trash can go a long way. 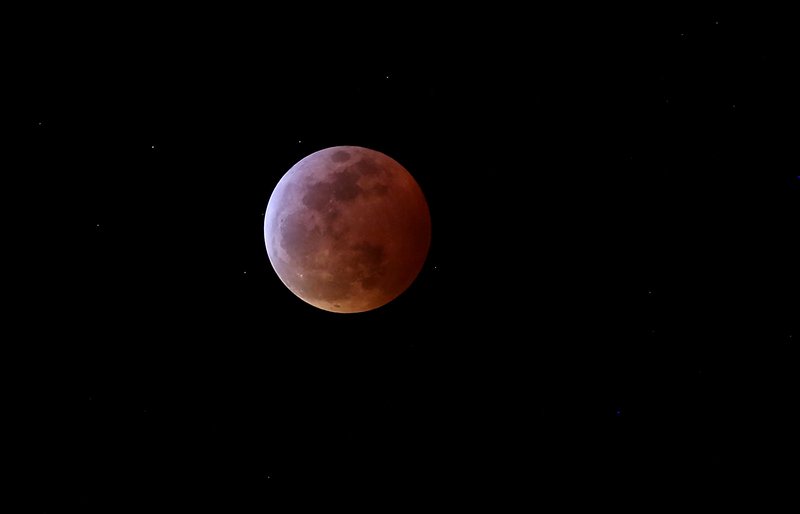 Stunning captures of the blood moon!